This year’s National Work Zone Awareness Week—themed “Drive Like You Work Here”— scheduled for April 8 - 12, 2019, reminds all drivers to watch out for state department of transportation (DOT) and private sector employees who work within inches of their vehicles. Extra attention is required for everyone's safety. About 700 people, including over 100 workers, are killed every year in work zone accidents. That means nearly four in five of the victims are drivers and their passengers. More than 35,000 people are injured in work zones annually. Drivers using their cell phones are 4 TIMES more likely to be involved in a crash. Read and follow work zone signs. Stay focused, and avoid distractions such as mobile devices. Expect the unexpected, try to anticipate problems. 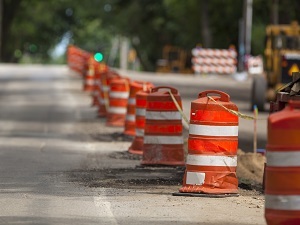 The American Road & Transportation Builders Association (ARTBA) works with state DOTs and other associations to promote National Work Zone Awareness Week each April—the traditional start of the busy highway construction season. All roadway safety professionals across the country are encouraged to wear orange on Wednesday, April 10 to proudly show their support of work zone safety. Go Orange Day and NWZAW is an important time to show your support of the roadway safety industry, especially to the families of victims who have lost their lives in work zones. Post your photos and videos to social media on April 10 with the hashtags #Orange4Safety and #NWZAW. In 2016, there were an estimated 158,000 crashes in work zones. Four out of five people killed in work zones are motorists – not highway workers. Most work zone crashes are rear-end collisions. While most major work occurs at night, the majority of work zone crashes occur during daylight hours. Major contributing factors in work zone crashes include: not paying attention, going too fast for conditions, failure to yield the right-of-way and following too closely. Safety training and education is one of the best ways to raise awareness about Work Zone Safety. The team at Weeklysafety.com encourages you to have a Safety Meeting or Toolbox Talk on Work Zone Safety with your crews and employees. If your teams do roadside work, then this would be a great opportunity to review safe work zone procedures. If your employees do not do roadside work, then consider having a safety meeting on tips for driving through work zones, like these listed below. Think Orange! When you see orange signs, cones and barrels, expect a roadside work zone ahead. Slow down. You may encounter slowed or stopped traffic in an instant. Don’t follow too closely. Maintain a safe distance on all sides of your vehicle. Minimize distractions. Just because you might be driving slower doesn’t mean it’s a good time to check your text messages! The leading cause of highway construction worker injuries and fatalities is contact with construction vehicles, objects, and equipment. These injuries and deaths are preventable through a number of good practices. As our highway infrastructure ages, many transportation agencies are focusing on rebuilding and improving existing roadways. This means more roadwork is being performed on roadways that are open to traffic. At the same time, traffic continues to grow and create more congestion, particularly in urban areas. To avoid major queues during peak travel periods, urban areas are seeing more night work. The combination of more work done alongside increasingly heavier traffic and greater use of night work can result in increased safety considerations for highway workers. However, there are regulations and available resources on good practices that can help workers perform their jobs safely. Visit the U.S. Department of Transportation Federal Highway Administration’s Work Zone Management Program to find a lot of great resources to improve your work zone safety program. For more information and resources on this year’s NWZAW campaign, visit the official National Work Zone Awareness Week website at nwzaw.org that has been completely updated for the 2019 campaign. Click the button below to download the full toolkit to promote National Work Zone Awareness Week 2019. The toolkit includes a kick-off event planner, community outreach ideas for Go Orange Day, a Social Media Guide, and much more. Check it out! Weeklysafety.com gives you and your company access to hundreds of safety meeting topics and toolbox talks, safety resources you won't find anywhere else, safety topics professionally translated into Spanish, and so much more. This includes safety topics on Work Zone Safety in both English & Spanish. Several versions are made available including 6-page Manager’s Presentations, 2-page Foreman’s Topics and 1-page Fast Toolbox Talks. yes! i want access to hundreds of safety meeting topics today!